The House Administration organizational chart shows, in a hierarchical format, the Board of Internal Economy, the Speaker and the Clerk followed by the seven service areas. Composed of Members from all recognized political parties, the Board of Internal Economy is responsible for all matters of financial and administrative policy affecting the House and its Members, premises, services and employees. It has the legal authority to make by-laws and to regulate the use of resources available to the House of Commons. As Chair of the Board of Internal Economy, the Speaker is the head of the House Administration and is responsible for its overall direction and management. The Speaker’s administrative duties also involve ensuring that certain documents are published on behalf of the Board, including the Members’ Expenditures Report and the Report to Canadians. As Secretary of the Board of Internal Economy, the Clerk is the chief executive of the House Administration and is responsible for the day-to-day management of House staff. The Clerk is responsible for maintaining records of the proceedings of the House, and all decisions made by the House must be authenticated by the Clerk’s signature. The Corporate Communications team provides the Board of Internal Economy, the Speaker’s Office, the Clerk’s Office and all service areas with strategic advice, analysis, products, tools and support related to corporate communications, corporate branding, crisis communications and public outreach. Preparedness and Planning provides subject-matter expertise, working closely with service area partners to facilitate planning processes that support decision making and ensure business resilience. The group also provides assistance with quality assurance and continuous improvement activities. As the House’s champion of good management practices, Internal Audit supports the House Administration’s mandate by providing objective and value-added assurance, risk management and advisory services on all strategic and management practices. The Office of the Law Clerk and Parliamentary Counsel provides comprehensive legal and legislative services to the Speaker, the Board of Internal Economy, Members of the House and its committees, the Clerk and the House Administration. The Office also drafts legislation and amendments for Members, and may represent Members or the House in proceedings that involve their parliamentary privileges and immunities. Providing procedural and legislative advice to the Speaker of the House and Members, Procedural Services also offers support to committees, conducts research and offers training on parliamentary practice and procedure, and coordinates Members’ participation in international and interparliamentary activities. This service area produces timely and accurate parliamentary information in both official languages, such as the transcript of the debates in the House or minutes of committee proceedings, and preserves and documents representative artefacts that chronicle the history of the Canadian Parliament. 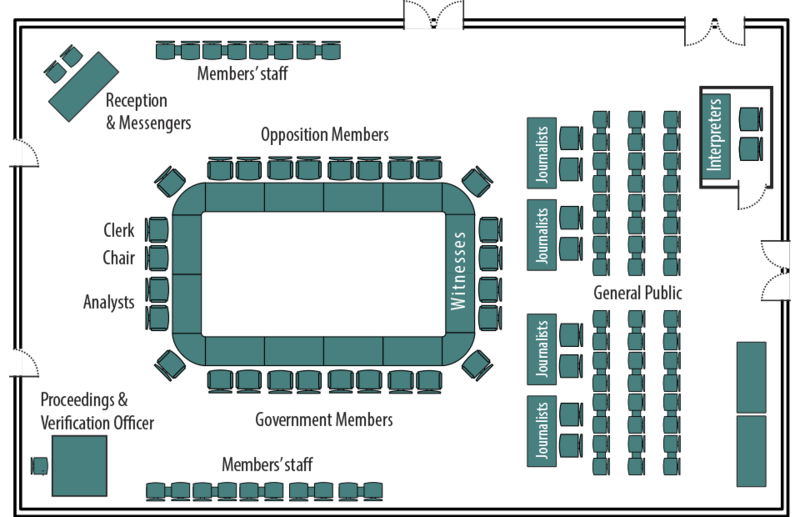 It also provides technical and administrative infrastructure for the Canadian Parliamentary Press Gallery. Digital Services and Real Property plan, implement and maintain information technology (IT) and information management (IM) services for Members and the House Administration. In addition, Digital Services and Real Property is responsible for the long-term IM/IT and accommodation planning related to facility renovations. Finance Services provide advisory and operational support in the areas of policy and financial planning, financial management, and materiel and contract management to the House Administration, Members and their staff. Human Resources Services provide integrated and value-added support in the areas of talent management, employee relations, pay and benefits, occupational health and safety, and organizational effectiveness. Parliamentary Precinct Operations provide efficient and modern operational support to ensure a functional work environment for Members and the House Administration. This includes the provision of services in such areas as trades, tenant operations, room allocations, catering and restaurants, postal and messenger services, transportation, printing and mailing, as well as maintenance and material handling. The Corporate Security Office is responsible for security in the House of Commons Chamber, conducting investigations, coordinating visitor and event access, providing security accreditation, promoting security awareness and administering parking services. The Corporate Security Office also develops and implements House-wide administrative security policies, standards, and processes aimed at preventing, detecting and responding to security risks and threats.